When I was doing my farm work in Australia it was winter and the coldest I’d been in at least a year, I honestly didn’t think Australia got that cold. Having swapped a white Christmas for a Christmas on the beach that year, when the weather got cold in July my head just didn’t know what was going on, I wanted mulled wine and gingerbread and a warm fire, none of which are available in Wentworth any time of year. But what was available were ginger kisses, which are essentially Australias answer to a whoopee pie, only gingerbread flavour. 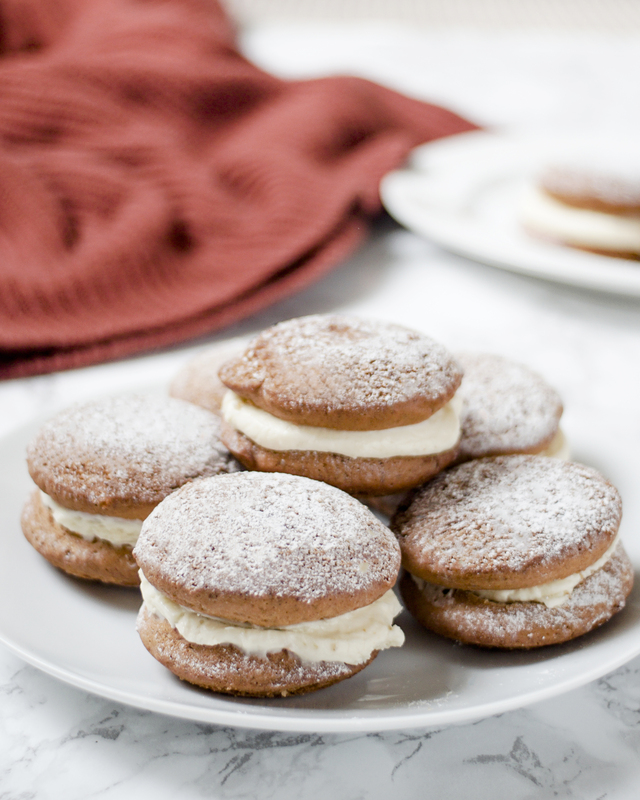 I’ve never tried making whoopie pies before, I’ve never had the tin to make them. But this weekend we popped into town and happened to stroll into a charity shop. Side note: anyone want to get into food photography, get down to your local charity shop or car boot, they are a treasure trove of props. But I was thinking about what autumn bakes I could do when I spotted a whoopie pie tin and a set of gingerbread cookie cutters, it was a sign. I had just that morning started to look on Amazon for whoopie pie tins and wasn’t convinced that it was worth spending £10 for a pan I wouldn’t use all that often. So needless to say I was over the moon. 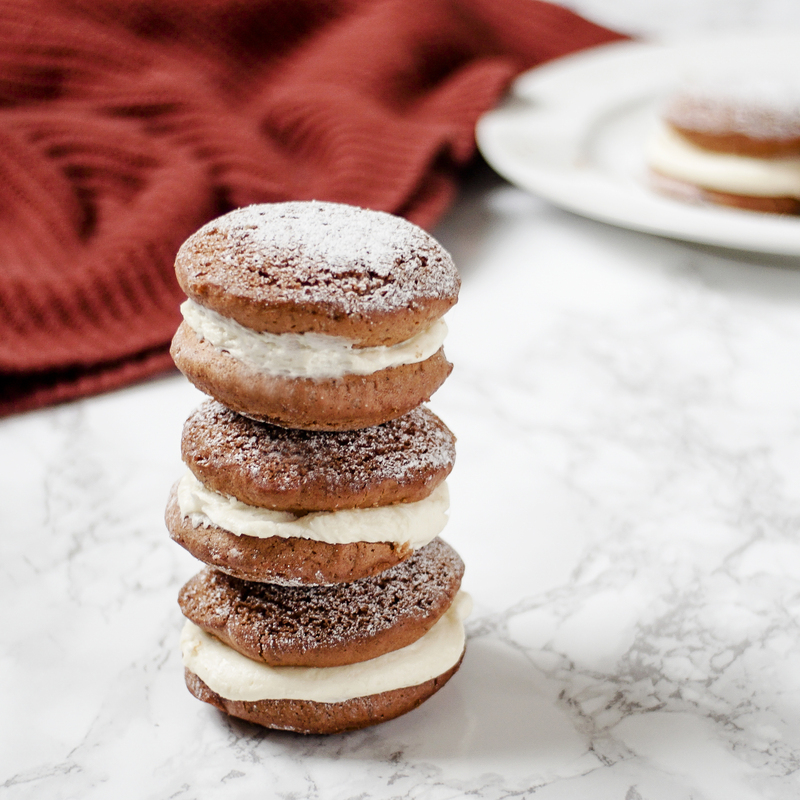 I love whoopie pies, they are like little mini cakes, they can be flavoured any way you want and are small enough so you can all of the flavours in one bite. I mean how many times have you had an awesome cupcake but can’t take a proper bite of both the frosting and the cake without getting frosting all over your face. Solution, two tiny flat cakes with the frosting in the middle. Preheat your oven to 190C/375F. 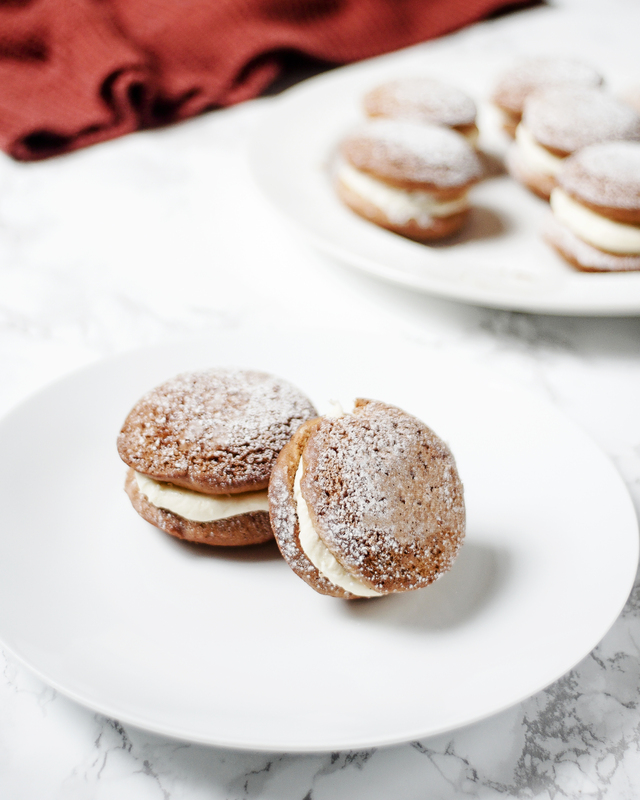 Lightly spray your whoopie pie pan with non stick baking spray or line and grease a flat baking tray. In a bowl, combine the flour, salt, baking powder, bicarbonate of soda, and spices and set aside. Beat together the butter and sugar until soft and fluffy. Add the egg and beat well making sure everything is well combined. Add half the flour mixture and gently fold to combine, then beat in the molasses, followed bu the rest of the flour, and then the buttermilk. Flat baking tray: Using a tablespoon scoop the batter onto your baking tray, leave at least 1″ between cakes to allow them to spread. Whoopie pie pan; using a table spoon, scoop the batter into each well greased hole. Bake until the cakes have risen and set, about 10 to 12min. When cooked, leave to cool in the pan, then transfer to a wire cooling rack. Using an electric whisk, beat together the cream cheese, icing sugar, butter and vanilla until smooth. Transfer the mix into a large piping bag with either a large round nozzle or just snip the end off the bag and pipe it like that, no need to be too neat. And there you have it, the perfect autumn treat. If you give these a go, let me know how it goes by tagging @whatseatingmanchester in your social media post! 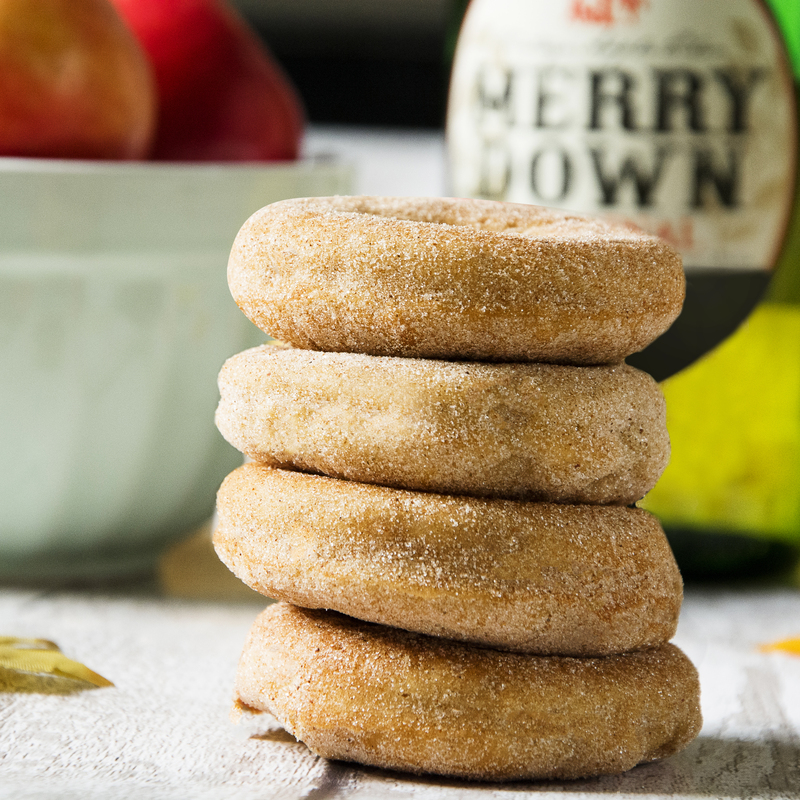 Yes you read right, apple cider baked donuts, don’t they sound amazing! Im feeling very fall right now as after a beautiful but short summer, Autumn seems to have depended on the north of England very swiftly … and its cold. Well probably not that cold but after the summer we have had its feels bloody arctic. So now all I want is hot spiced cider and pumpkin pie and its only September! 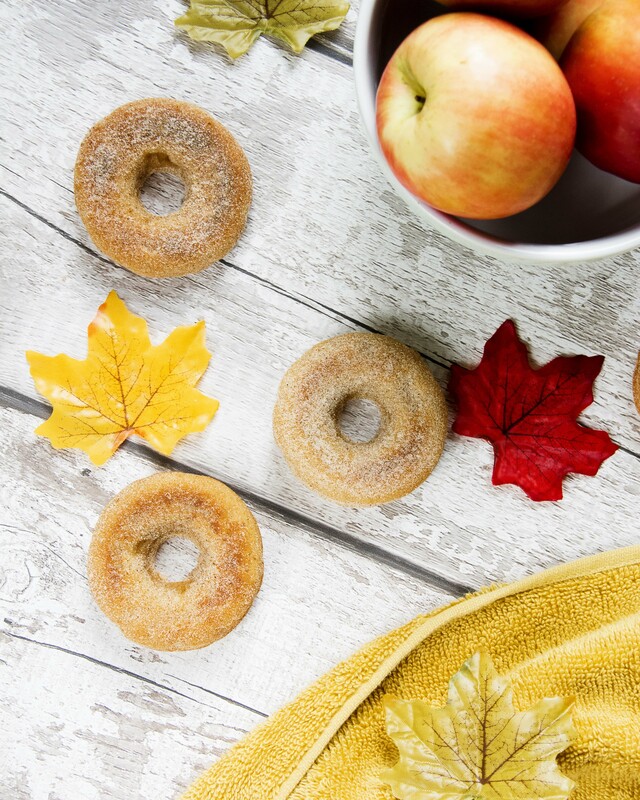 These donuts have a basic baked buttermilk base which incorporates warming spices and cider poached apple puree to give them a fantastic apple pit meets hot spiced cider feel. 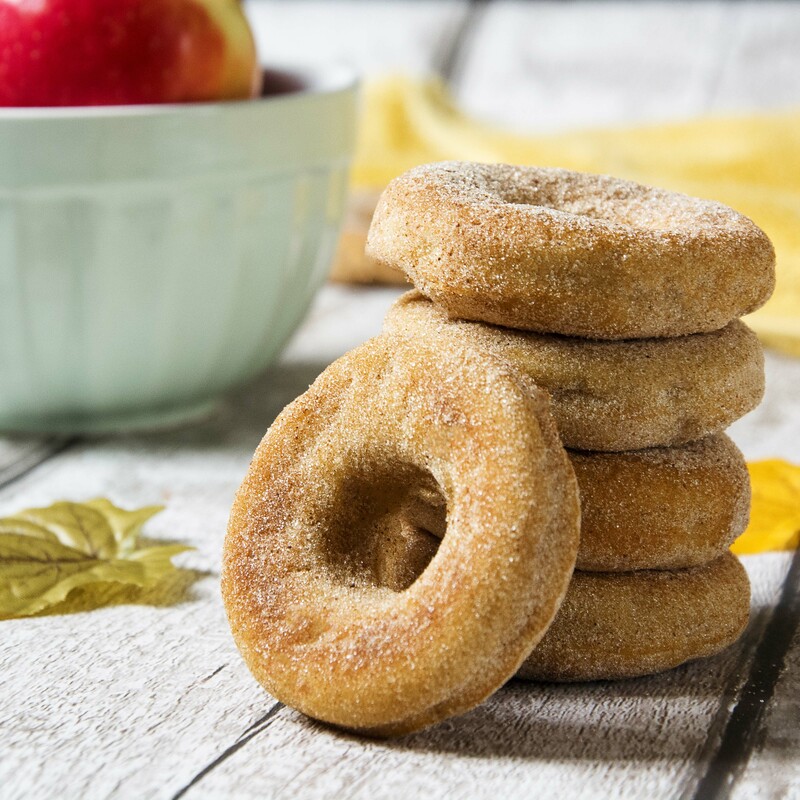 Generously coated with cinnamon sugar, they are sure to be a firm favourite this fall. Pre heat your oven to 200C and grease 2, 6 hole donut pans with non stick cooking spray. I use 8 hole donut pans as I like smaller donuts but its your choice. Peel, core and roughly cube the apples. In a medium pan on the hob, add the cider and chopped apple, let the apples poach and soften on the hob for around 15 minutes. Meanwhile prepare the batter. In a large bowl, beat together the butter, oil, and sugar together until combined. Add the eggs one at time, beating each one into the batter well before adding the next. Add the vanilla and whisk until well combined. In a separate bowl, add the flour, baking powder, salt, baking soda, and spices and fold together to combine. Stir the flour mixture into the wet ingredients, followed by the buttermilk and stir well until everything has combined. Your batter should be quite thick. When the apples are soft and the cider has reduced set the pan aside to cool for 5 minutes before pureeing the mixture in a blender. If you don’t have a blender mashing the apples will be fine. Add your puree apple and cider mixture to the batter and stir well to combine. Transfer the batter into a disposable piping bag or plastic sandwich bag with a small corner cut off. Pipe the batter into the pans, filling the moulds only 2/3 full. Bake for 12-15 minutes or until donuts spring back when pressed. 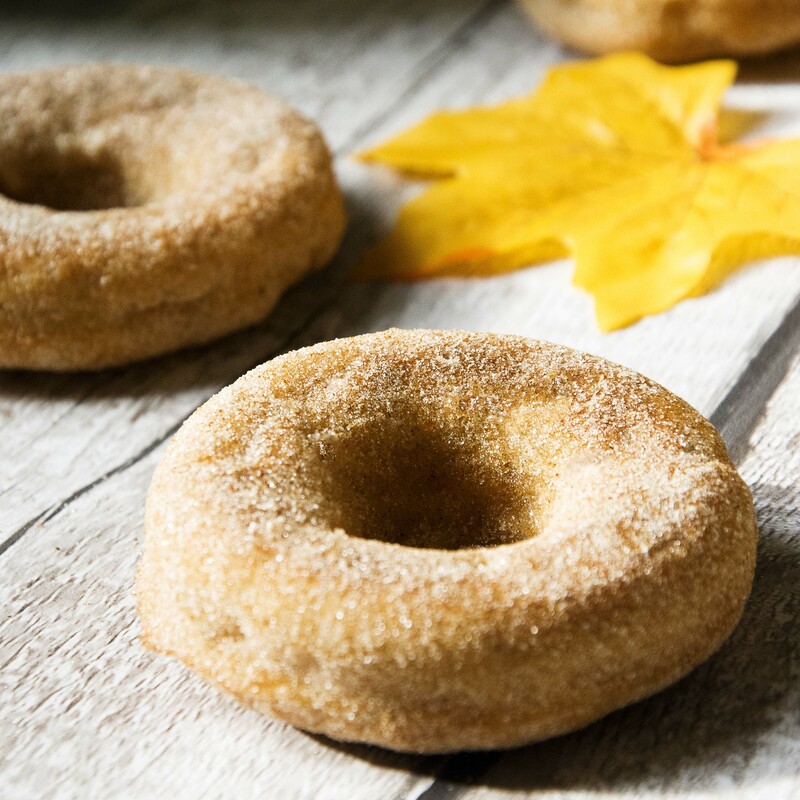 Set the donuts on a wire rack to cool while you prepare the cinnamon sugar. In a plastic ziplock bag add the caster sugar and cinnamon, shake to combine. Add the donuts one at a time, sealing the bag and shaking the mixture to coat the donut. Once all of the donuts have had a generous coating of sugar, serve and enjoy. 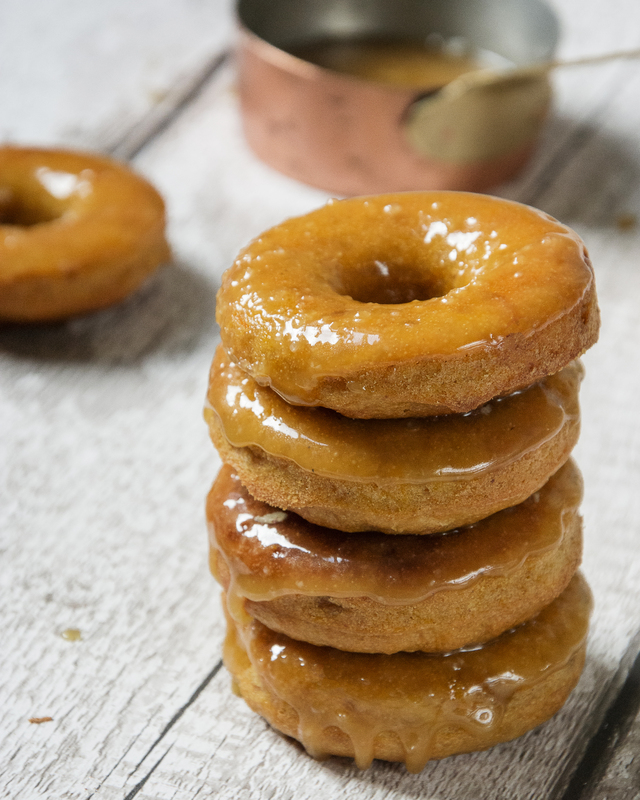 And there you have it, perfect baked pumpkin donuts, a real autumn treat! If you have a go at making these yourself make sure to let me know how it goes by tagging @whatseatingmanchester in your social media post. I love Italy! I love everything about it, the art, the culture, the accent and especially the food. Particularly the little biscotti biscuits they serve with coffee, my favourite are amaretto as I also can’t get enough of amaretti biscuits, damn those Italians know how to dunk. We British have the tea dunking down to an art but we tend to blur the lines between whats good to dunk in tea and whats good for coffee. So autumn has officially defended here in The North and with autumn brings my favourite day of all days ….. Starbucks pumpkin spiced latte day! And oh what a glorious day that is, the first pumpkin spiced latte of the season, all cosy and warm by the fire watching a movie with a huge cup full of pumpkin amazingness. My boyfriend and I already knew what we were going to do with our Saturday afternoon. But I had that baking twitch for all things autumn and knowing that that first glorious sip was only hours away I thought it only fitting that I bake something to go with the eagerly awaited coffee. 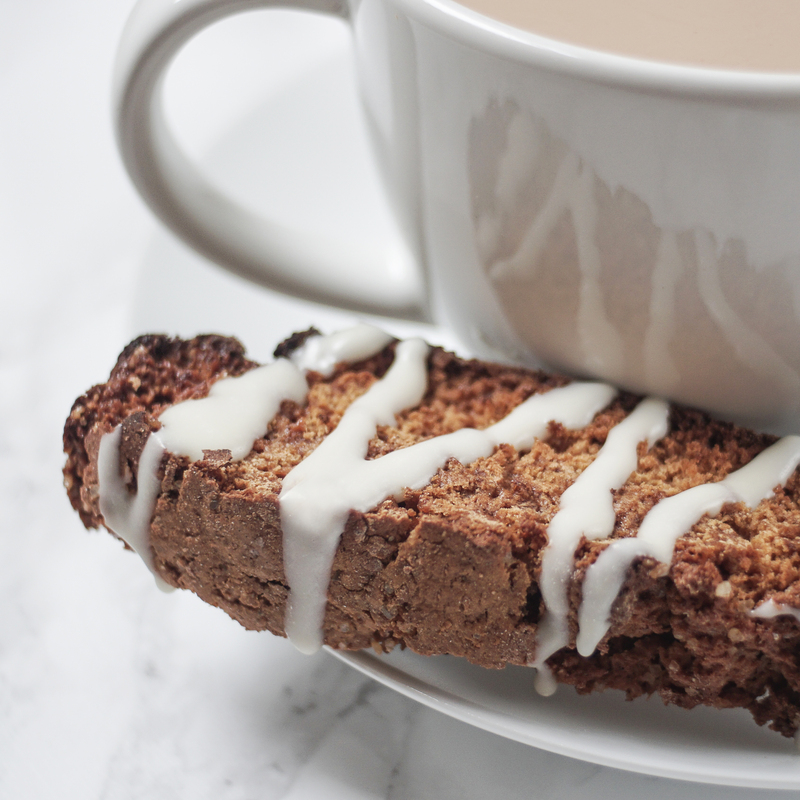 Biscotti means twice baked, the dough is formed into a kind of squashed log and baked, once firm it is taken out of the oven, let cool a little, sliced and baked again for a further 10-15 min to get that good biscotti crunch and dry quality that is going to soak up all of your coffee. This recipe is really versatile, take out the spices and add a different flavour more to your liking or add chopped nuts or dried fruit, you can really make it your own. Pre-heat your oven to 180C / 350F. Line a flat baking tray with baking paper, spray with non stick cooking spray and lightly dust with flour. In a bowl combine all of your dry ingredients and set this to one side for later. Using an electric mixer, beat together the eggs, sugar and treacle. Slowly adding your flour mixture until it combines and becomes a dough. Divide the dough into two shaping them one at a time into log shapes about 25cm/10″ long and about 5cm/2″ in diameter. Bake the dough in the oven for 30-40min or until they are golden in colour and spring back when touched lightly. When baked remove from the oven and set aside to cool. 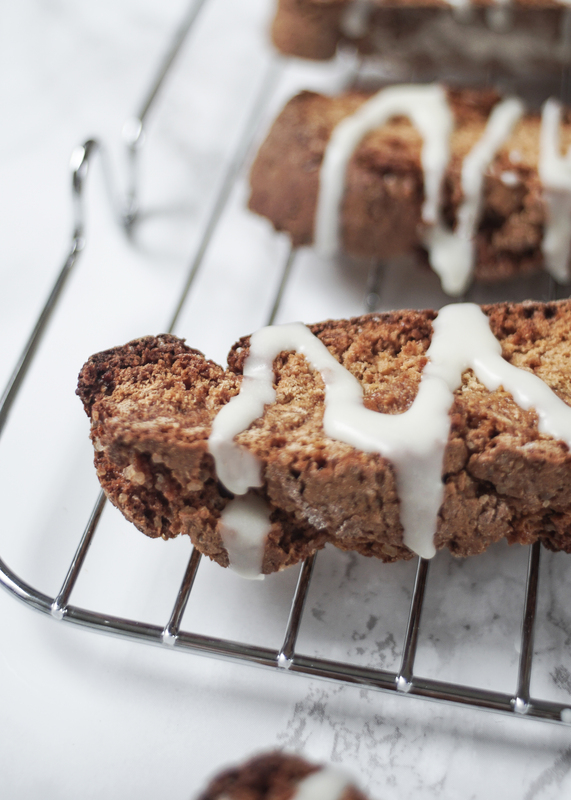 When cooled transfer to a cutting board and using a serrated knife slice the log into 1cm thick slices and lay the slices flat back on the baking tray and place back in the oven for a further 10-15min until the biscotti are beautifully golden and crunchy. When they are baked leave to cool completely whilst you prepare the chocolate. Melt the chocolate in the microwave in blasts of 30 seconds, making sure to stir the chocolate in-between and check that its not burning. 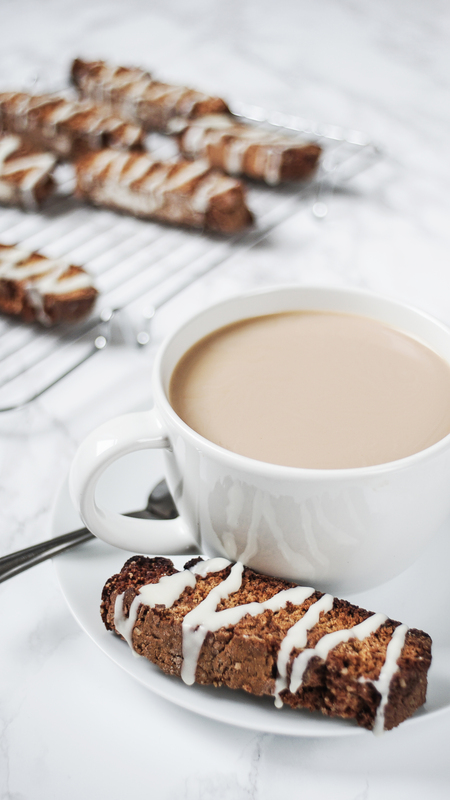 Once your chocolate is melted either dip one end of the biscotti into the chocolate and leave to cool or transfer the chocolate to a piping bag and pipe a zig zag pattern as I have. Serve when the chocolate is completely cooled. And there you have it, the perfect accompaniment to your morning cappuccino. If you make this yourself let me know how it goes by tagging @whatseatingmanchester in your social media post! 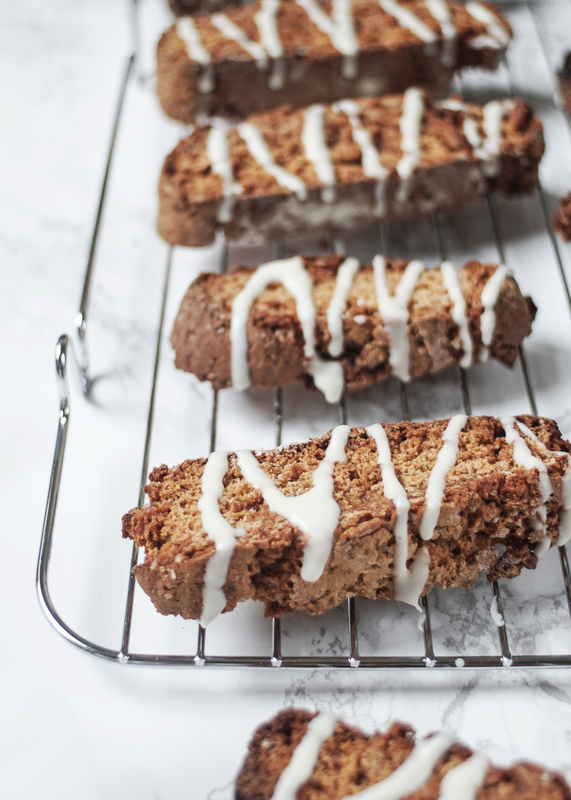 Making biscotti last weekend really gave me a craving for Italian sweets and I have been dying to make some of these amazing amaretti biscuits for days now. I’m a coffee person and I love something sweet to dip into my brew. These are a perfect treat for unexpected guests as they are super fast to whip up and bake in only 15 min. You can have the whole recipe baked, on the table with a cup of coffee and the washing up done in half an hour. 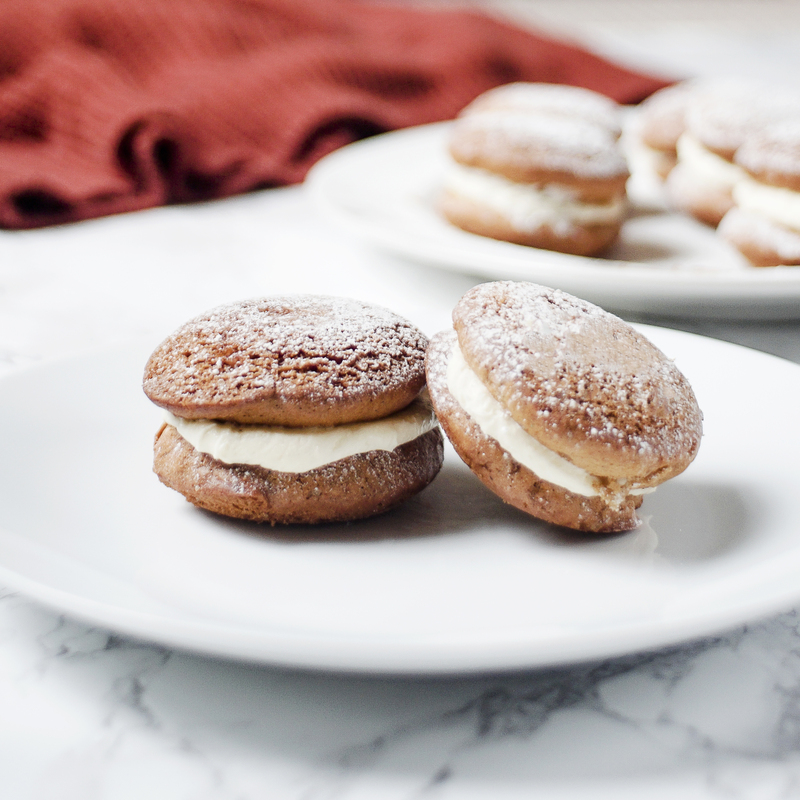 The next time you make custard or use a recipe that calls for egg yolks only save the egg whites (you can freeze egg white and defrost as needed) and whip up these amazing little almond cookies later. They are also a perfect Christmas gift, perhaps for you colleagues or neighbours, pop them in a cute jar with some ribbon or a cellophane bag. Very few ingredients and you can make large batches at a time and they are dairy, gluten free and vegetarian so you don’t have to worry about making different cookies for different people. Preheat the oven to 170ºC/340F, line two baking sheets and spray with non stick cooking spray. In a bowl, using an electric whisk, whisk the egg whites until firm. Gently fold in the sugar, almonds and amaretto until you have a smooth paste. Using a teaspoon, place dollops of the mixture on the trays, 2cm apart. If you are adding nuts to your biscuits, pop one whole almond/pecan into the centre of the biscuit and press down lightly. Bake in the oven for 10 to 15 minutes, or until lightly golden. Transfer to a wire rack to cool, then dusting with icing sugar. And there you have it, possibly the easiest and quickest biscuit to make. Packed with flavour, soft on the inside and crunchy on the outside, perfect to serve with your mid morning coffee. If you give these a try let me know how it goes by tagging @whatseatingmanchester in your social media post! 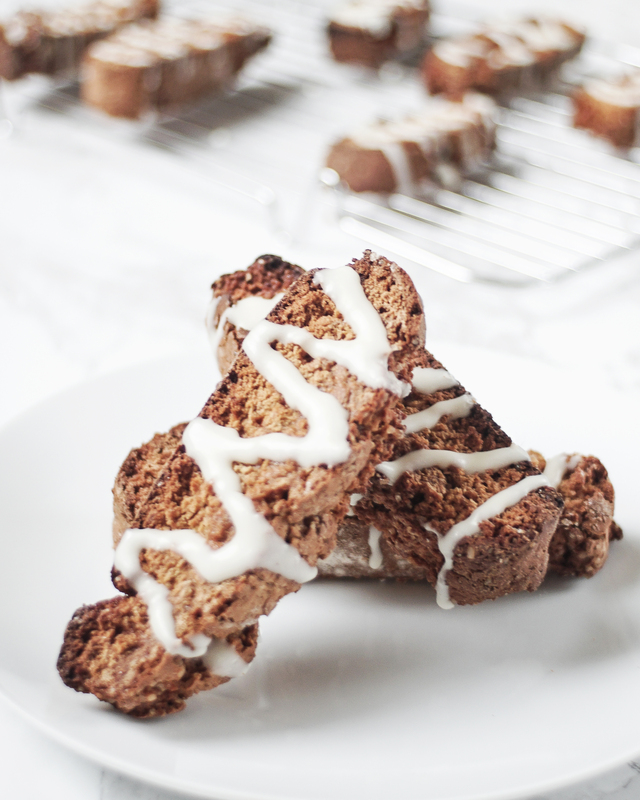 This recipe started off life as a serious craving for a Starbucks pumpkin spiced latte. My boyfriend Sam had told me, to my horror, that he had never tried one and since they came out this week I immediately marched him down to our nearest Starbucks to take his pumpkin spiced virginity. But apparently autumn had yet to arrive at our local store and they weren’t available yet. On the way home, disheartened I had him stop at a supermarket and I decided to make use of the donut pans I have, but have only used once. It can be hard to find pumpkin puree in the UK, I have seen that Tesco stock it online sometimes but I have seldom come across it in stores. You can buy real pumpkins in October but I’m not about chopping up, boiling and pureeing a pumpkin, nor am I about to wait until October for my fix. My salvation came from McCains frozen cubed pumpkin, boiled for a few minutes and popped in the blender, it did en excellent job of substituting canned pumpkin. 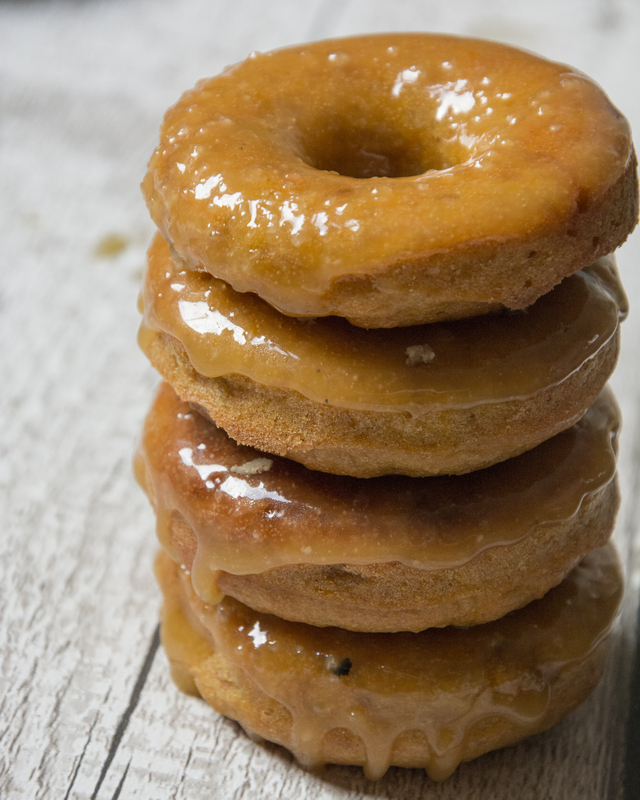 These baked donuts are moist, spiced and utterly delicious. 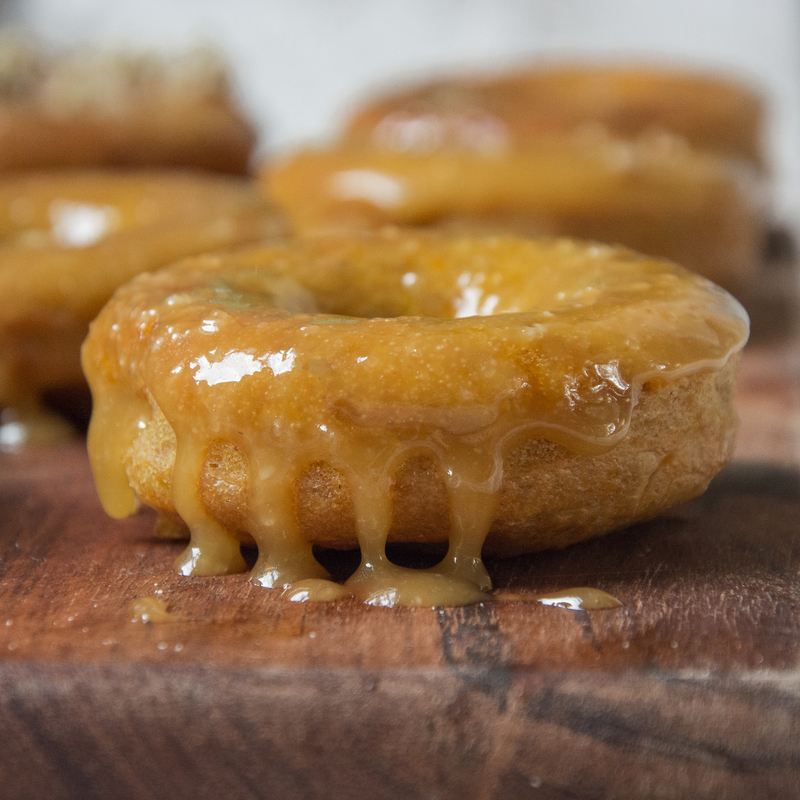 Topped with a sticky caramel glaze and filled with warming spiced they are guaranteed to get you in the mood for short days, crisp leaves and pumpkin spiced lattes by the fire. For the pumpkin puree you can either buy it tinned if you can get it or buy frozen pumpkin, defrost it and puree it yourself in a blender. 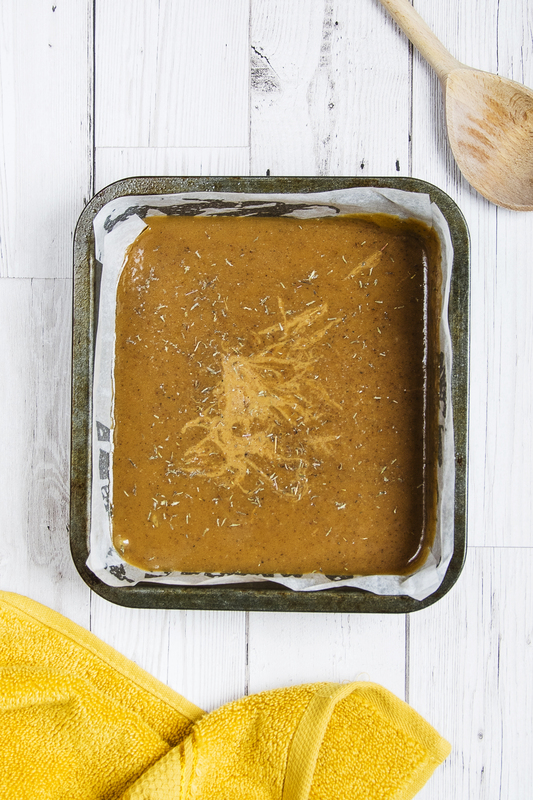 In the past I have found it hard to find pumpkins at all here in the UK but I have tried this recipe with frozen then blended butternut squash and it has worked just as well. They are from the same family and once baked practically taste the same. Pre heat your oven to 200C and grease 2, 6 hole donut pans with non stick cooking spray. I use 8 hole donut pans as I like smaller donuts but its your choice. At this point stir in your pumpkin puree. Bake for 12-15 minutes or until donuts spring back when pressed. Set the donuts on a wire rack to cool while you make the glaze. In a pan on a medium heat melt the butter and vanilla together. Once melted add the sugar and simmer gently, stirring constantly until the sugar has fully dissolved. Once the glaze has thickened, this should take 10-15 minutes take the pan from the heat and set aside to cool for 5 minutes. Once the glaze has cooled a little give it one final vigorous stir and you are ready to glaze. 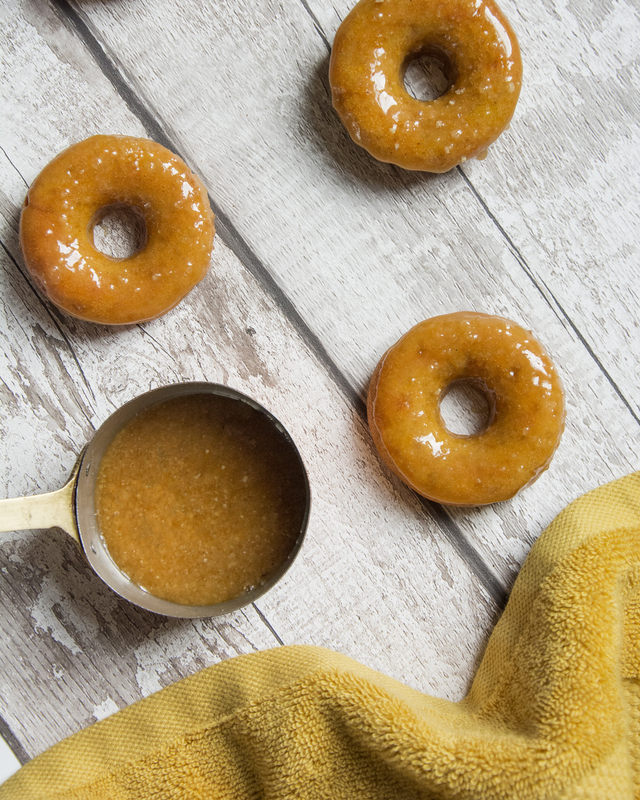 Dip one side of the donut into the glaze, let it drip slightly then transfer to a wire rack to cool completely. The glaze will still be VERY hot so be very careful not to get any of the glaze on your hands. 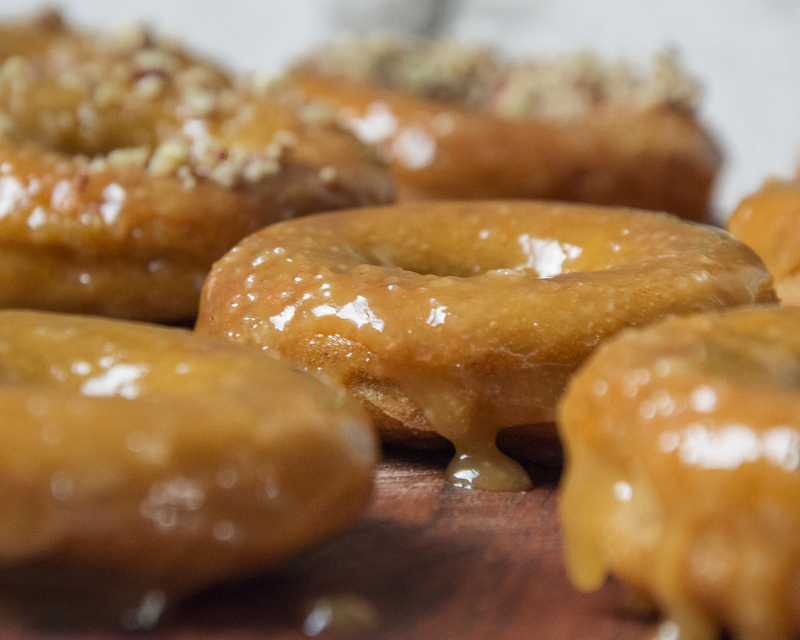 Once all of the donuts have had a generous coating of glaze and are cool, serve and enjoy. 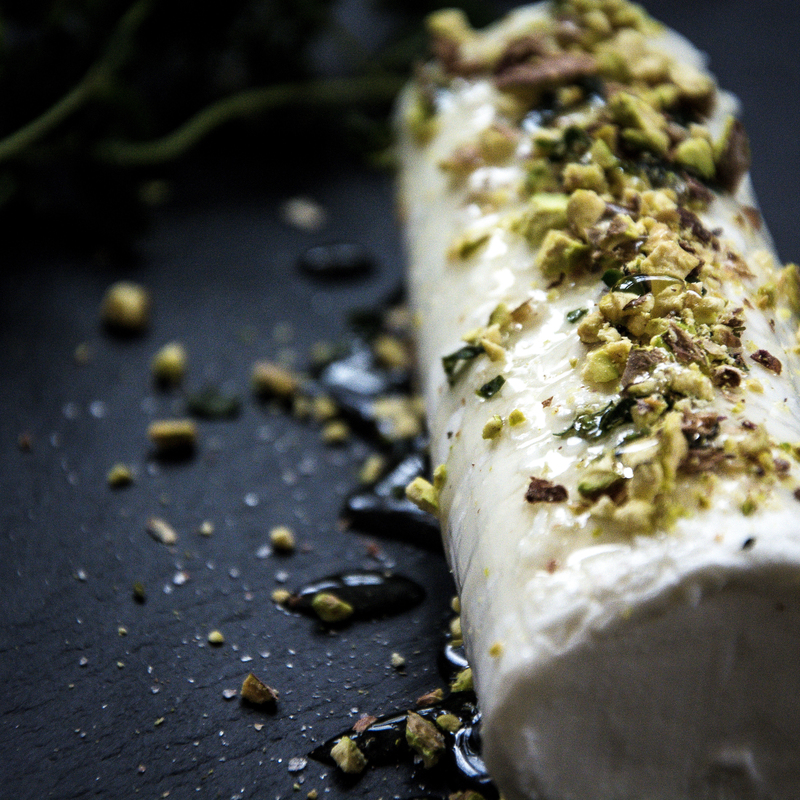 Easy, delicious goats cheese appetiser! The most amazing addition to any cheese plate. Everyone knows I love cheese. Like a deeply inappropriate obsession with cheese. And goats cheese is my favourite. The ultimate for me is Holy Goat – La Luna from Victoria in Australia. If you ever get a chance to try it, please do, it is the most fabulous cheese, beautiful depth of flavour. 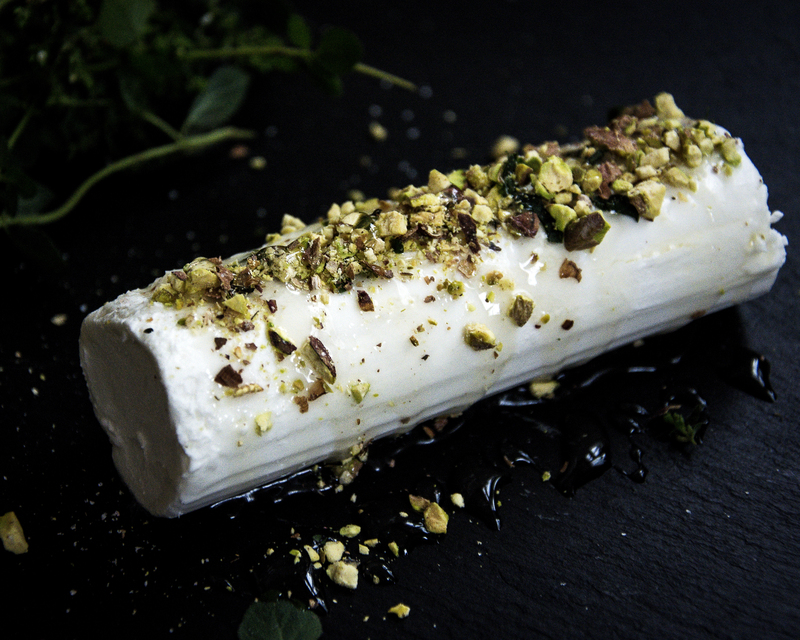 But sometimes you can’t always get hold of amazing goats cheese, sure you can find good goats cheese in most supermarkets these days but lets be honest, its not great. 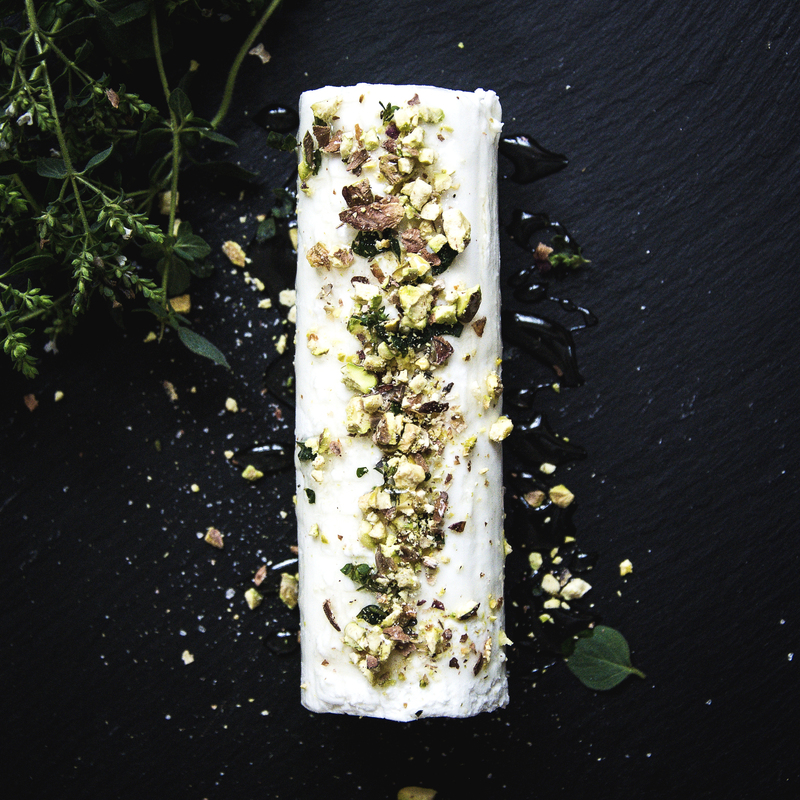 But with a little extra attention you can turn a good supermarket goats cheese into a showstopping appetiser or a fabulous addition to any cheeseboard. This recipe can really be adapted to your needs, I really wanted to add fig but I couldn’t find any fresh or any fig preserve (first world problems I know!). Also feel free to play around with different nuts, pistachios would be amazing or even pine nuts, feel free to experiment. You could even try adding maple syrup, I used honey because I still have some of the local allotment honey left and it was beautiful with the goats cheese. Simply crush up the walnuts by popping them into a plastic bag and going to town with a rolling pin. Don’t crush them to a powder but nice small little pieces are great. Roughly chop the thyme and add it to the walnuts. Top the cheese with the walnut and thyme mixture, I find it easiest to pop the walnuts and thyme on the counter and press the cheese into it, then just turn the cheese upside down and drizzle with the honey. And its that easy! I love when a dish requires minimum effort but packs a maximum punch. If you try it let me know how it goes by tagging @whatseatingmanchester in your social media post. When I worked for a restaurant group in Sydney around Christmas the chefs made hundreds of boxes of fudge to give to customers, staff and suppliers as Christmas gifts. When everyone they could think of had received a box, us lucky guys in the office got to take home the left overs, and let me tell you it was the best thing I have ever tasted! It was salted all butter fudge with a kind of herb sprinkled on top and for the life of me for a long time I couldn’t work out what this herb was but it really made the fudge amazing. After a lot of experimenting and frustrating days spent slaving over a hob I came to the conclusion that this secret ingredient was Thyme. 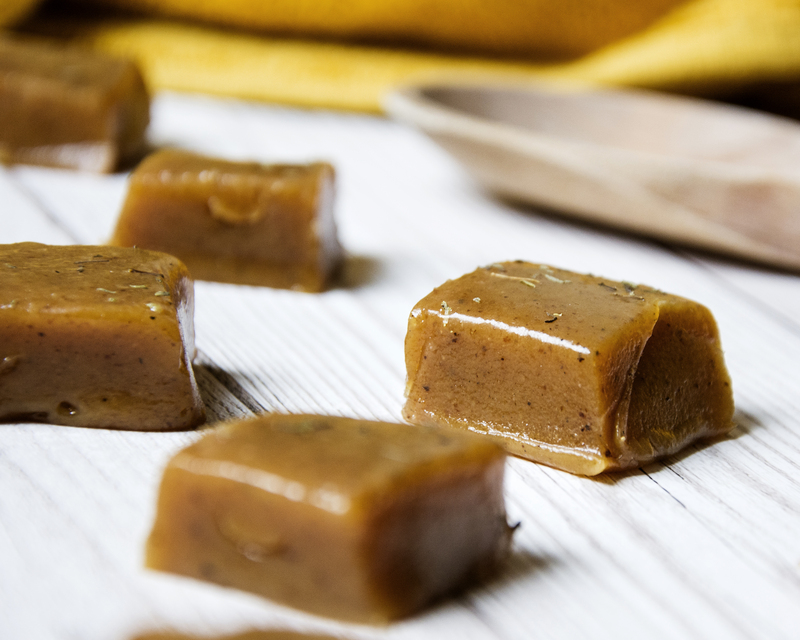 The simple addition of this herb to the fudge really makes a different, its beautifully aromatic and it gives the fudge a depth of flavour and a quirkiness that you’re not expecting. Now I haven’t ever been able to recreate exactly the same fudge, I am not by any means a world class chef but I have taken inspiration from their genius and incorporated this idea into my own easier fudge recipe. The basis of the recipe is from Carnation just because its the easiest way to make fudge I have ever found. But it has had my own little spin on it . I love fudge, it seems to be the quintessential British gift when you go on holiday, it certainly beats a stick of rock. And these are so perfect to just pop in a cute tin or a plastic bag with a bow and gift to friends at Christmas or as a cute wedding favour. 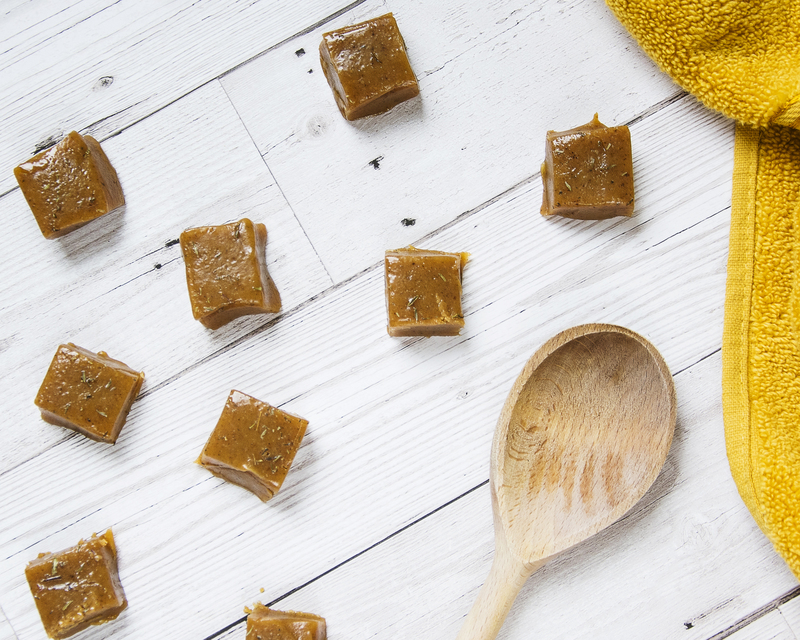 Keep aside to sprinkle on top of the fudge – a pinch of salt and thyme. Place all the ingredients into a saucepan and heat over a medium heat until all the sugar has dissolved. Bring to the boil then simmer for 10-15 minutes. Keep stirring. And stirring … and stirring. Seriously, find a 15 minute long Youtube video and watch it whilst stirring you’re in it for the long haul. The stirring is non negotiable. After 10 minutes you need to check to see if its ready. Go grab a glass of cold water and put a drop of the fudge in the water. Its ready when the drop forms into a little ball of fudge. If it doesn’t, keep simmering and stirring and test it again … and again … and again. All good things come to those who wait. Take the fudge from the heat and beat it with a wooden spoon until its thick and creamy and just beginning to set. 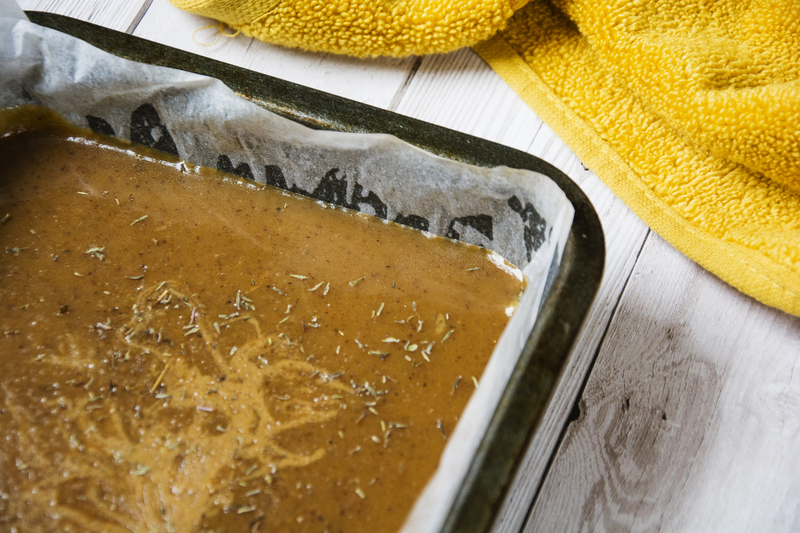 Transfer to a lined, greased square baking pan sprinkle with a pinch of salt and thyme and leave to set in the fridge until its completely cooled. Remove from the pan, cut into squares and serve. And there you have it, the perfect edible gift or easy to make treat. If you try it let me know how your fudge turns out by tagging @whatseatingmanchester in your social media post! 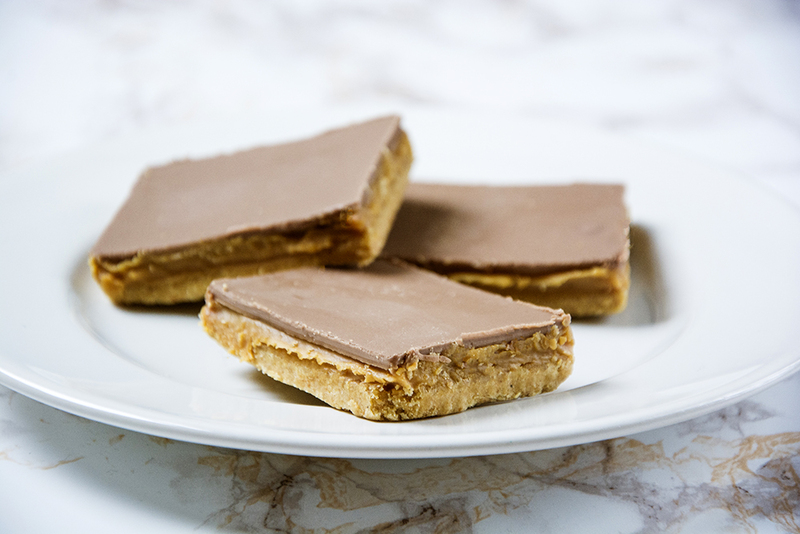 Millionaires Shortbread, a classic, rich and indulgent treat for all occasions. Everyone loves millionaires shortbread, apart from me apparently. Sure I think its okay but I’ve never really been a fan of really rich desserts, a few bites and I’m done. But I know its a classic and everyone loves it, especially my boyfriend who is the polar opposite to me when it comes to desserts he loves rich and indulgent desserts. 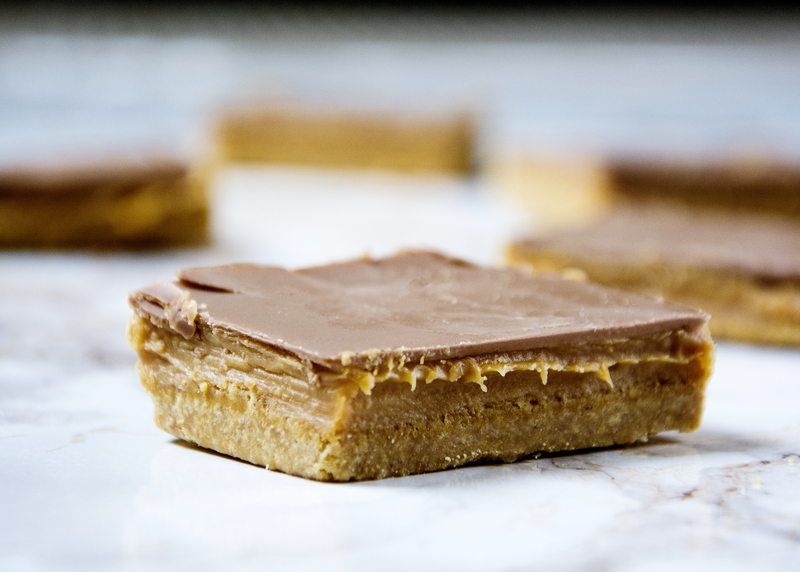 Millionaires shortbread is a classic, beautiful buttery shortbread, rich creamy chocolate and sandwiched between is gooey caramel. It really does take a little extra effort but its totally worth it. 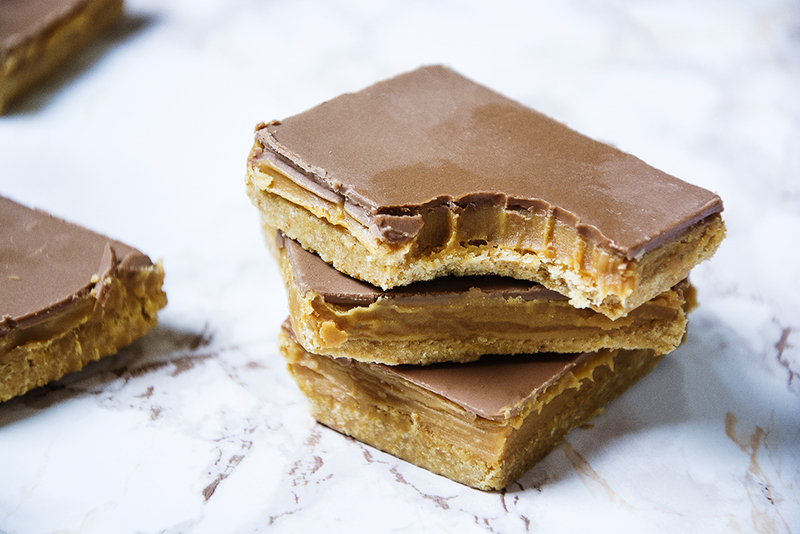 Caramel can be a little tricky if you’ve never made it before but once you have the gist of it you’ll be making your own for everything. 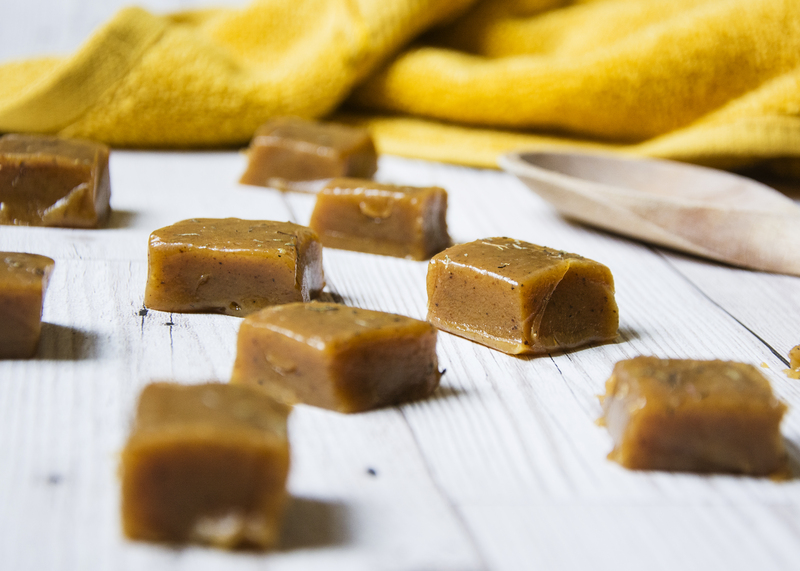 It really is worth making your own, the only place you can get amazing ready made caramel in my opinion is in Cartmel in the Lake District here. You can’t seem to get it online but I’m sure with a bit of searching you can find it. Trust me its the best caramel in the world. If you can get this, don’t bother making your own, it will never be as good, just saying. Shortbread is a really good recipe to master, it can be used as a base for a lot of recipes, It’s always a good gift and and its relativity simple to whip up when you need something quick. Preheat your oven to 160C/140C fan/gas 4. Line and grease a 9″ square cake tin. Rub the flour and sugar together with your fingertips until the mixture resembles breadcrumbs. Press the mixture firmly into the baking tray and bake for 40- 45 minutes. Then leave to cool on a wire cooling rack. Pop all the ingredient into a pan and heat over a medium heat, stirring continuously for 10-15 minutes. Seriously, don’t stop stirring. After 15 minutes remove from the heat and beat the mixture with a wooden spoon for around 10 minutes until the mixture turns thick and fuggy. Leave it to cool for 5-10 minutes before transferring it to the pan on top of the cooled shortbread. Then pop everything in the fridge to cool completely. Melt the chocolate and the butter together, either in a bowl over a pan of boiling water or in 30 second blasts in the microwave stirring every 30 seconds. 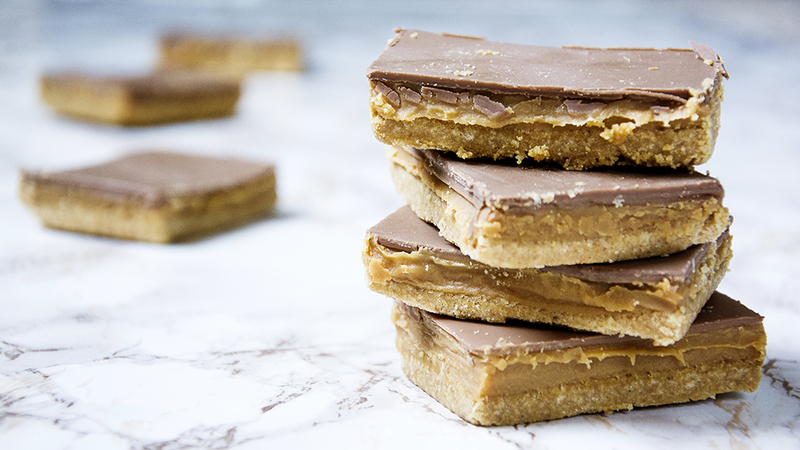 When melted, give it a good stir and pour over the cooled shortbread and caramel and leave to set in the fridge. When everything has cooled and the chocolate has hardened remove from the pan and slice into even squares. d there you have it if you give it a go let me know how it goes by tagging @whatseatingmanchester in your social media post. For more recipe inspiration check out my blog. There really isn’t any other food that conjures up memories of my childhood like a simple fruit crumble. It was one of the first desserts I learned to cook with my grandmother. We would always make apple crumble and custard when I visited. 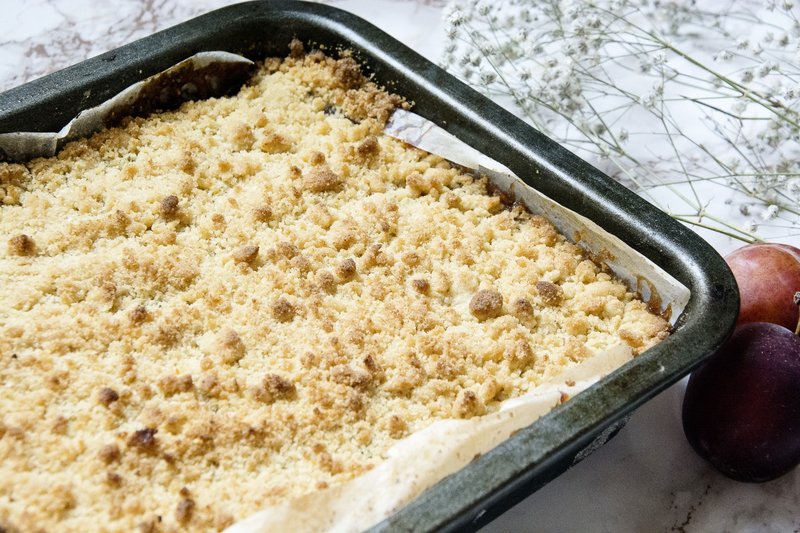 Some of my fondest memories are of learning how to rub the butter and flour in-between my hands and fingers to create the beautiful crumble topping. Unfortunately apples aren’t in season yet and I wanted to use the apples from the garden when they are ready, so I thought I would take advantage of the last of the seasons cherries. That was until I couldn’t find any fresh cherries and when I did the price made my eyes water. Looks like I missed the season by a few weeks. But then I thought about it and when it comes to baking I think you can get really good results from frozen fruit, sure not all fruit is appropriate to use frozen and not every dish can be adapted but sometimes, especially berries and exotic fruit are so expensive that it can make the recipe as a whole just too expensive to bother with. Thats when we tend to give up and buy a dessert instead of make one ourselves. Cherries especially are expensive to buy and then time consuming to pit. I think with a little extra effort grabbing a bag of frozen and cooking them down on the hob to cook out any extra water is really worth it. 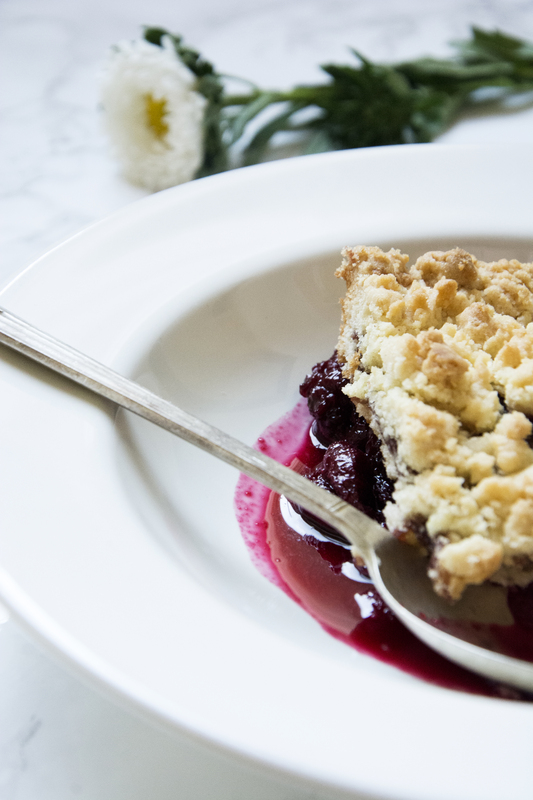 In the long run it saves time and money as you can be preparing the crumble whilst cooking down the cherries. 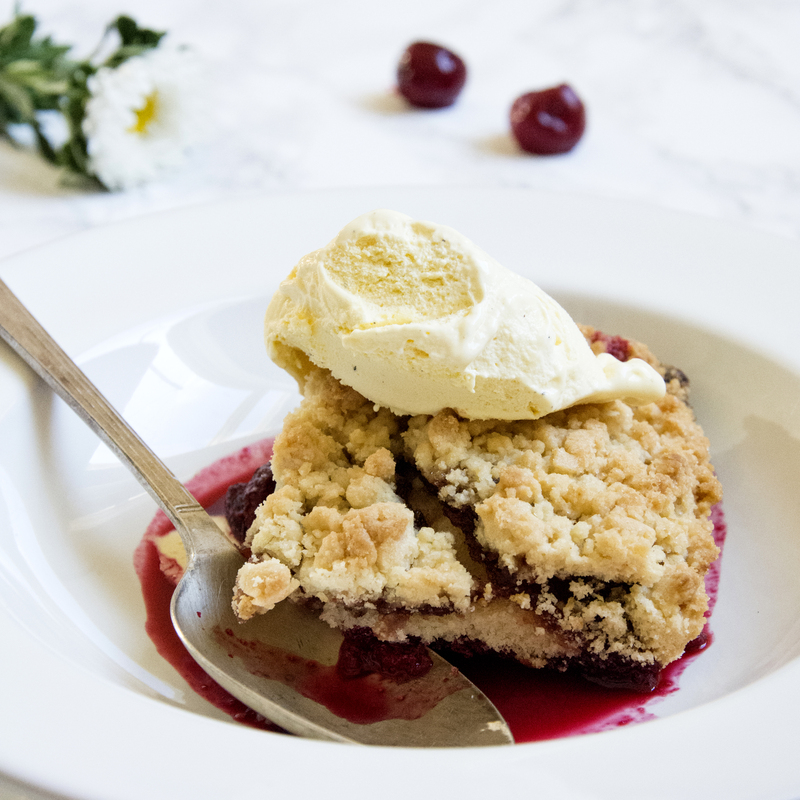 This simple cherry crumble is really simple to prepare and is such a beautifully warming dessert that it is bound to become a firm family favourite. Of course if you would like to use fresh cherries then thats fine. Just add the pitted fruit, sugar and vanilla to the bottom of the dish raw, top with the crumble and bake as usual. Preheat your oven to 180C/350F/Gas 4. Sieve the flour into a large bowl and add the salt and sugar mixing well. Add the butter and rub the mixture between your fingers, keep going until it resembles breadcrumbs. Place the fruit in a large pan and cook on a medium heat until the cherries have softened. This should take around 5 minutes. After this add the sugar and vanilla. Keep cooking until the juices have thickened and most of the water has cooked off. This usually takes around 15-20 minutes. Spoon the fruit mixture into the bottom of an ovenproof dish, then sprinkle the crumble mixture on top. Bake for 40-45 minutes until the crumble has browned and the cherries are bubbling. Serve with ice cream, cream or custard. And there you have it! 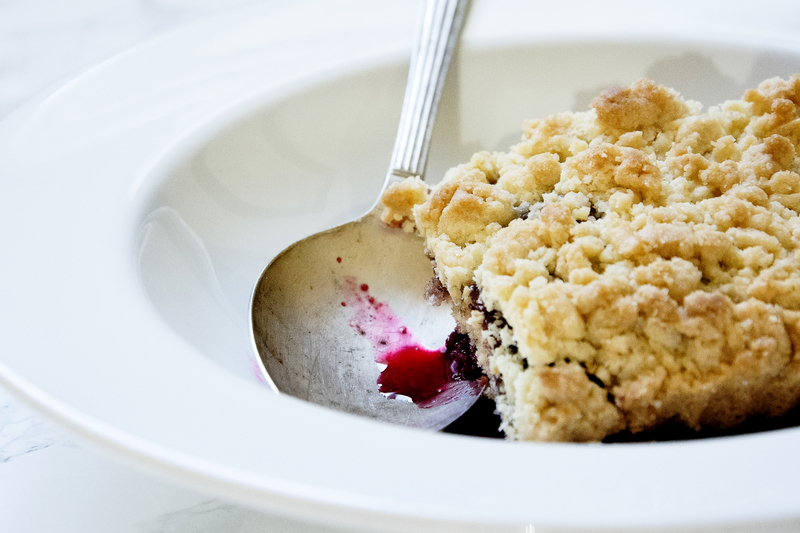 A beautifully vibrant cherry crumble. Let me know how yours goes by tagging @whatseatingmanchester in your social media post! 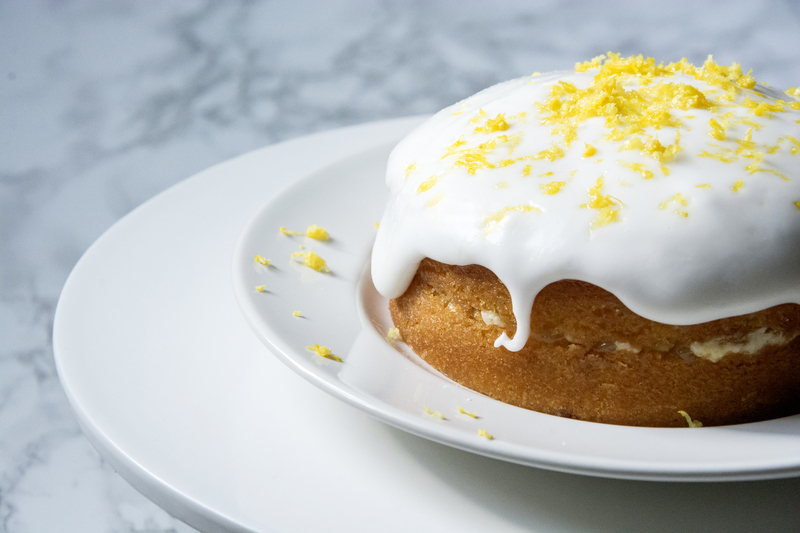 Lemon drizzle cake or buns have to be my all time favourite kind of cake. Don’t get me wrong I absolutely love a good carrot or coffee cake but lemon drizzle cake is where my heart truly lies. I adore the sweet tart combination of the sugar and the lemon juice. 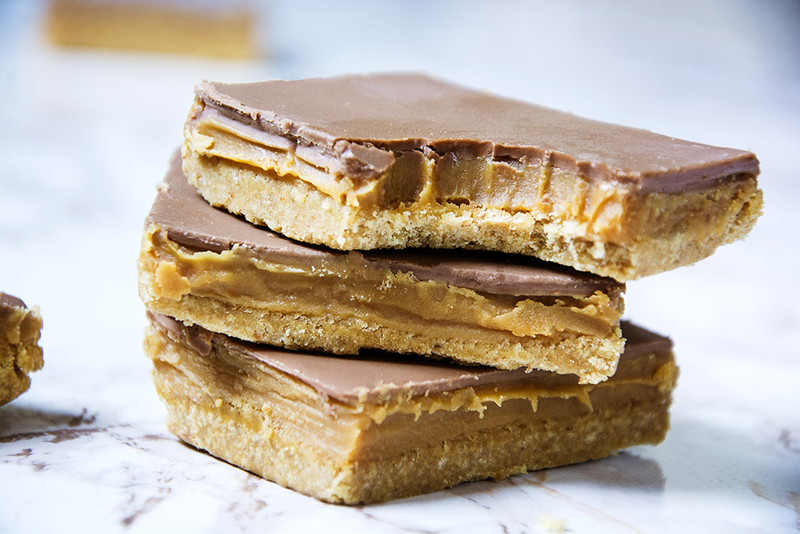 I’m not much of a fan of heavy desserts, I love chocolate and caramel but I find them too overpowering and sickly to eat more then a few bites. 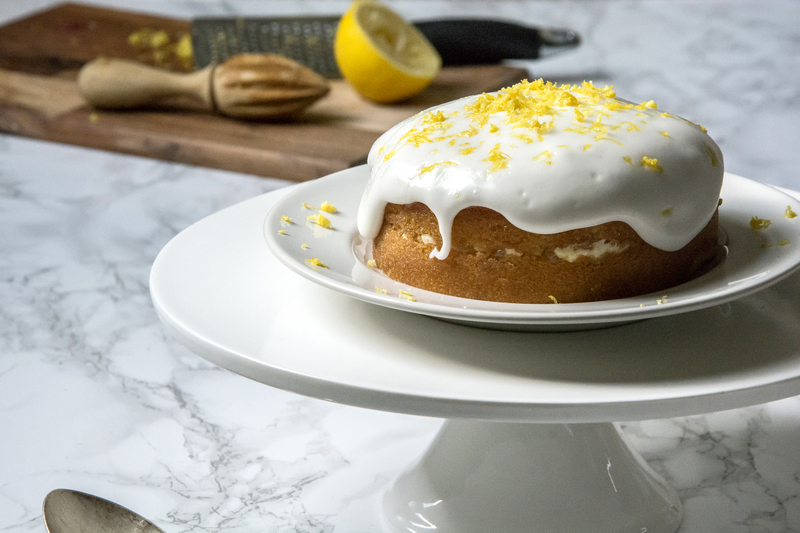 This lemon drizzle cake however is just the right combination of tart lemons, moist cake and aromatic lemon zest. At the moment I am trying out recipes for a family baby shower. The mum to be is going for an Alice in Wonderland tea party theme, lots of cakes and afternoon tea treats. So I have been trying out recipes to see which ones will be best suited to batch make 30 portions. 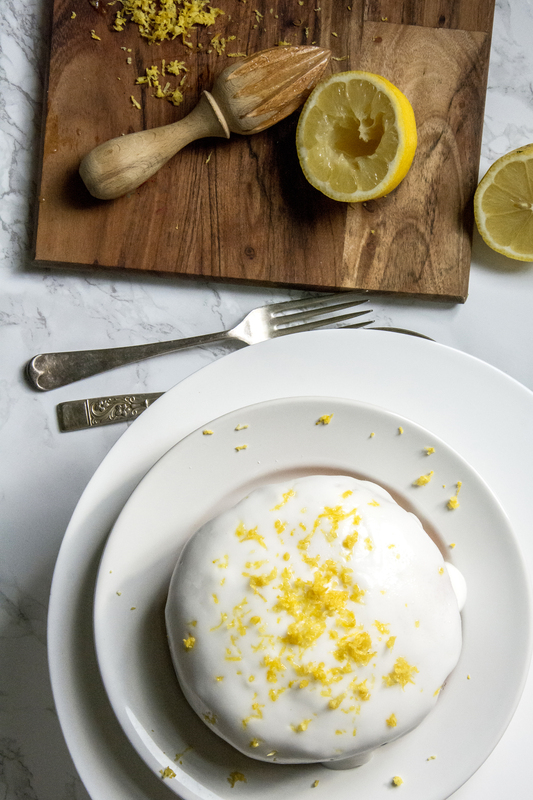 This lemon drizzle cake is so easy, equal quantities of flour, sugar, eggs and butter make it super easy to scale up or down depending on what size cake you need. I think a good combination of chocolate and fruit based cakes will be the winning combination and I’m still working on a jam tart recipe because they really need to be the show stopper! 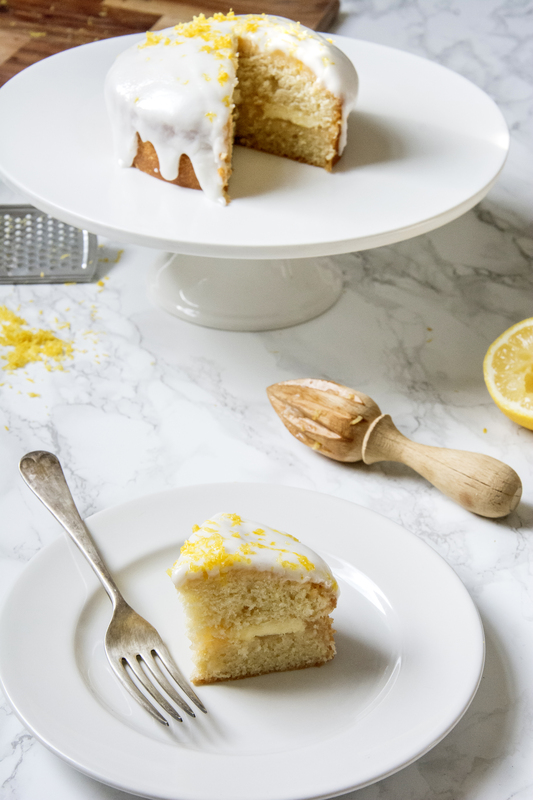 This lemon drizzle cake is so super easy to make, you can bake it in either one or two pans depending on what you have and of course if you have my much loved set of shallow baking pans you can halve your bake time and spread the batter into 3 or 4 layers. I didn’t this time as someone has borrowed my pans so I was doomed to wait around for what seemed like an eternity for the cake to bake. 1st world problems. Using an electric mixer leat together the butter, icing sugar and half of the zest until pale and creamy. Leave in the fridge until needed. Add in the eggs one at a time beating well in between each. I tend to add a spoonful of the flour with each egg to help it combine and not split. Bake for between 45 and 50 minutes checking regularly after 30 minutes to make sure nothing is getting too brown. To check that the cake is ready insert a clean skewer or butter knife into the centre of the cake. If the skewer comes out clean it is ready, if not just pop it back in the oven and repeat the process in 5-10 minutes until the skewer comes out clean. When the cake is ready leave it on a wire rack to cool completely. When the cake is cool cut it in half horizontally and spread an even layer of the filing on the bottom half, then replace the top half. 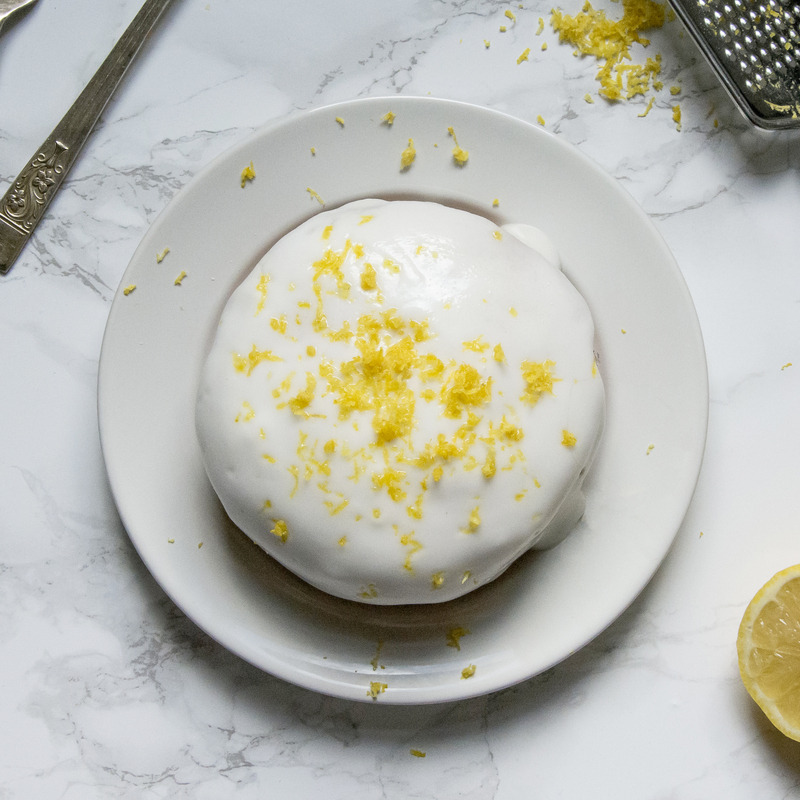 To mix the icing, place the icing sugar into bowl adding a table spoon of lemon juice at a time and mixing well in between each. Repeat until icing is at the desired consistency. I like my icing to be quite thick but still a little runny but if you like thin icing add more lemon juice. If you run out of lemon juice just use water. It won’t affect the flavour too much. Spoon the icing on top of the cake, right in the centre and let it drip down naturally . 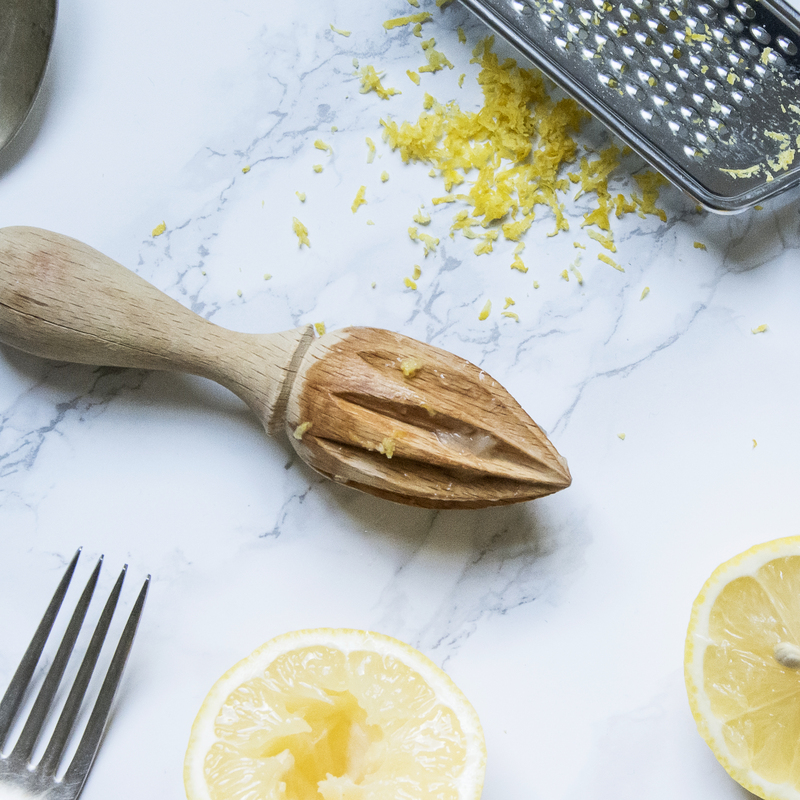 Top it off with your remaining lemon zest and you’re done. And there you have it. Perfect for any celebration! If you try out this recipe let me know how it goes by tagging @whatseatingmanchester in your social media post.